Are you looking for ways to achieve a unique style in your home without spending a fortune? Over the years my love of home decorating and my personal cottage style have both evolved, but my desire to decorate on a budget has not. Okay I’ll just say it – I’m cheap! A tightwad! A miser! 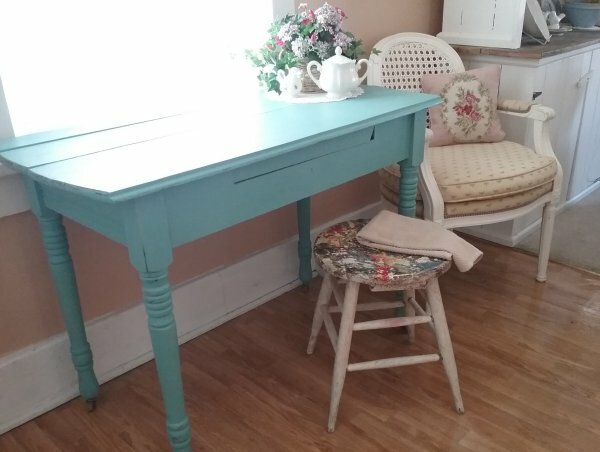 Everything I’ve done to enhance my home has always been done with very limited funds, and as a result I’ve become more patient in my shopping, and more creative in my repurposing. Here are the best ways I’ve learned to decorate on a budget, whether buying secondhand or (occasionally) brand new. Shop your house. Is it possible you already have something that will work for the space you’re decorating? Walk through not just your rooms, but your attic, basement and garage too. Maybe-just-maybe there is something you already own that you’ve forgotten about! Shop secondhand. Thrift stores, garage sales, and other secondhand venues are all great places to find great furniture and other décor items. Repurpose. Look at an item you do have (or are considering buying) and determine if it can be repurposed or upcycled to solve a new problem. Can you turn that low-slung wooden coffee table into something for the kids’ playroom? Turn a pretty flat sheet into café curtains for the kitchen? Make a hall tree out of a vintage door? Make your own. In an online décor group recently, someone asked for help in locating a sign for her kitchen that read, “Pantry.” She told the group she had already looked at Michael’s and Hobby Lobby, and couldn’t find one. My thought was, why not just make one? A hand-made sign would be simple to do, and have a lot more character and personality than something mass-produced. Shop sales, coupons, and deals when buying new. Speaking of Michael’s and Hobby Lobby, they have had some really cute décor in recent years! And they both have pretty amazing coupons such as 40 percent off a regularly priced item. Even a store that doesn’t coupon is likely to eventually put items on sale, so pay attention to the circulars and online ads. 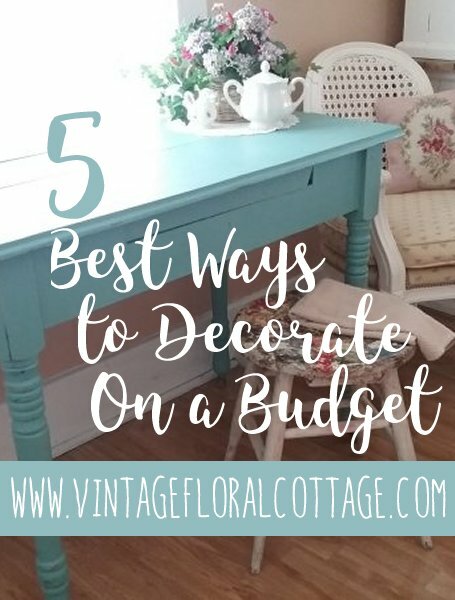 There are so many ways to decorate on a budget… honestly, my style is all about timeworn, well-loved, vintage items with character and history, and that means I would very rarely buy something brand new. It also means that I almost always pay less-than-new prices. What are your favorite ways to decorate on a budget? Here’s a Pin-able image for this post! This entry was posted in Thrift Store Maven. Bookmark the permalink. Shopping my home and trading home decor with friends are two of my favorite ways to decorate on a budget! I totally should have included “trade with friends or family” to this list… one of my favorite pieces of furniture in my home came from a trade with a friend! 🙂 So glad you stopped by, Lisa! Great ideas, Janet! I love to shop my home…and my mother’s home too! Lynne – that’s awesome… another one I should add to the list… “Don’t let family get rid of anything without talking to you first” – love it! I have lots of family pieces in my home as well! I have just come back from a second hand store, always find pretty things! Same here, Fiorella – I rarely come home empty-handed! Sometimes the perfect item is right under our nose. Of course, it might be buried under a few other items…! 🙂 That just makes it all the more satisfying to find it!